Who knew there was so much to learn about ties and tuxes! This week on our sister site, Tahoe Unveiled, we were educated on all the different stylings of Tuxes and Suits. From American to Italian, take a peek & click on the image below for all you might ever want to know! Spring is in the air! And with this gorgeous time of year comes closet cleaning, fresh clothes, and flowers blooming everywhere! Why not give your guests something to admire long after the nuptials by sending them off with a floral favor. You can collect different types of seeds from your local flower shop and bundle them up with a sweet card and planting instructions or spend the day with your bridesmaids planting little seedlings in miniature flower pots that will bloom all summer long on your guests' window sills - brilliant! We put together this inspiration board for Tahoe Unveiled (our sister company) and thought you might enjoy it! This board takes an organic approach to wedding style and shows how natural elements and a little creativity can be used to create a feeling of casual elegance. After a spectacular night of dancing, playing ping-pong and corn hole, and sipping on margaritas, it was time to end the celebratory week! Just in case everyone didn't get enough of the stunning lake views, we planned a post-wedding brunch at Gar Woods. The private room has tall windows and a private balcony overlooking the lake. Guests were treated to a feast consisting of smoked salmon, fresh fruit, roast beef, roasted potatoes, and plenty more! For decor, I setup the lovely flower arrangements from the wedding. Congrats to Angela and Jeremy - have a wonderful time on your honeymoon in Maui! events have been geared towards entertaining their guests while providing a hassle free vacation. All ages have been invited and every detail has been thought of and seen to. When I first met with Angela and Jeremy, the bride and groom, they requested a non-traditional celebration - no first dances, no formal traditions, and absolutely no fuss. 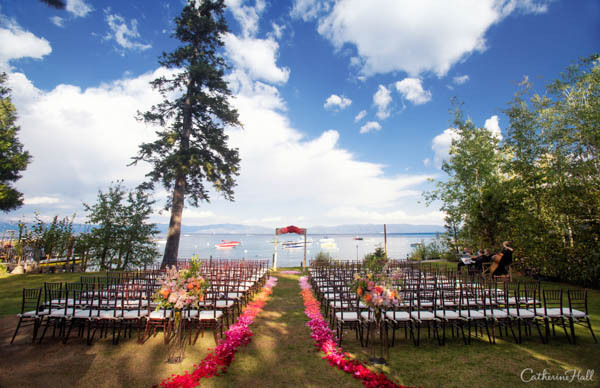 This morphed into a week-long celebration of pure Tahoe fun blended with bikinis, Vera Wang dresses, sumptuous food, and lakefront vows. Follow us for the next few days as we document the daily events and trials & tribulations of planning a flawless celebration for Angela and Jeremy's wedding! We just received the images from our Memorial Day Wedding! A day after another late Spring snow fall, the weather thankfully cleared and the sun finally came out ... just in time for Rose and Dan's outdoor ceremony at the new Ritz-Carlton Highlands. It was beautiful! Rose and Dan are quite possibly the most laid back bride and groom I have ever met. They took the planning stumbles (of which were many) with ease and were as sweet as pie! Words can't even describe how elated I am for Jon & Jessica. They had the most magical wedding I have ever coordinated! A huge amount of planning, organizing, and strategizing was involved with an outdoor ceremony in the middle of winter during a series of storms. But, it was beautiful and so worth it! 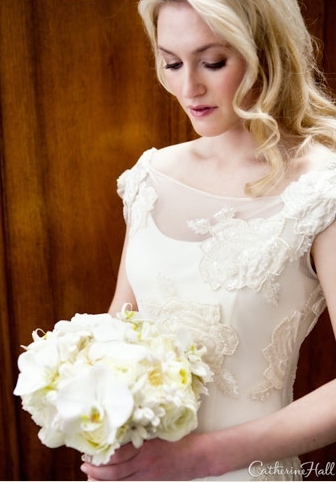 Thanks to the fabulous photographer, Mike Larson, and his team, here are a couple sneak peaks. More to come soon! Carolyn and Ken were married on a perfect, crisp winter day in North Lake Tahoe. The families rented large cabins in Squaw Valley equipped with hot tubs, numerous bedrooms, pool tables, foosball, and large refrigerators. The in-house entertainment assisted in keeping this destination wedding's cost to a minimum. The ceremony took place at Queen of the Snows Catholic Church in Squaw Valley. As a huge storm delivered 6 feet of snow a few days prior the bride entered through a roofless tunnel of snow and into the back door. The reception was held at PlumpJack Squaw Valley Inn. As guests entered from the cold, they were greeted by a warm candle-lit foyer with a beautiful glowing place-card table. Bellissima Floral created a gorgeous 3 tier display of red cherries, floating candles, red berries, and white roses, which made for a welcoming ambiance that set the intimate and romantic setting for the evening. 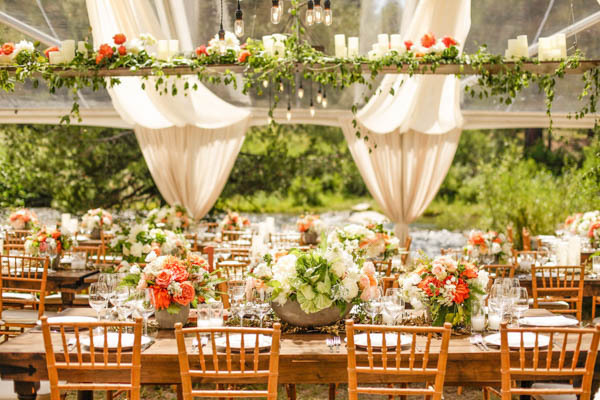 This ambiance continued in the reception room with aspen trees lit up with white lights and pictures of the couple growing up hanging from the branches; votive candelabras on the tables; and a 13 piece band to entertain the guests all night long.